Germany's 13 wine regions welcome visitors with open arms. Each region has its particular specialty, and regional cuisine, as you might imagine, pairs perfectly with the best local wines. You can tour wineries if you arrange your visit in advance, and wine producers, wine bar owners and restaurateurs will happily point you toward their best offerings. Let's take a closer look at wine travel in some of Germany's most famous wine regions. The Mosel wine region, formerly called Mosel-Saar-Ruwer, produces world-class rieslings. When you see the steeply-sloped vineyards that slant down toward the Mosel, Saar and Ruwer Rivers, you'll marvel that grapes have been grown here for over 2,000 years. There's a reason, though, that Mosel wine producers spend the money to hand-tend their grapes. Mosel's top wines are truly special. The region's rieslings are often called "racy" and "slaty" because the minerals in Mosel's slate- and limestone-based soils come through in the wines. The Mittelrhein wine region's fame encompasses much more than wine. The Upper Middle Rhine Valley is a UNESCO World Heritage Site, well-known for its castles, spectacular scenery and historic areas. You can visit Roman ruins in the town of Boppard, explore ruined castles and chapels (try Burg Rheinfels) and take a Rhine cruise, disembarking at picturesque towns along the river. Bacharach, which built its prosperity on the German wine trade, is a wonderful place to start exploring the area. Walk the town walls or hike up the steps outside of town to get a good look at the vineyards. 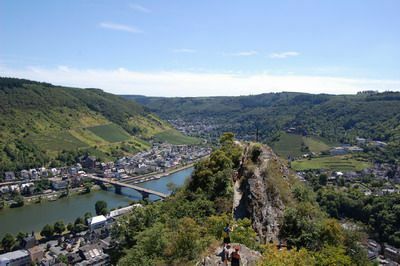 If you can tear yourself away from the hiking trails, Loreley statue and riverside restaurants, consider visiting a winery or two. In Germany, calling ahead is the proper way to begin your winery tour. You can also book an overnight stay at some Mittelrhein wineries and wine bars, including Estate Ratzenberger in Bacharach and Weinhaus Heilig Grab ("Holy Sepulchre") in Boppard. Many visitors to Bavaria skip Franken (Franconia), the northern part of the Free State of Bavaria (Freistaat Bayern), in favor of the stunning Alpine scenery in the south. However, for wine lovers and history buffs, Franken is a must-see destination. Franken is best known for its white wines, which are normally sold in rounded bottles called bocksbeutel. The origins of the name are obscure, but the most popular explanation is that the shape of the bottle resembles a goat's scrotum. The bottle shape itself is protected within the European Union; only certain European wines, including specific wines from Franken, may be sold in a bocksbeutel. Franken is best known for its white wines, which are traditionally made from silvaner grapes, but may also contain other varietals, including Müller-Thurgau, the region's most widely-planted grape. You might wish to start your Franken wine experience at the Juliusspital in Würzburg. This hospital, which still operates today, dates back to 1576. Sale of wine from the hospital's vineyards has been a source of funding from the very beginning. Today, you can tour the cellars and taste one or more of the wines produced there. (Most tours are in German, but English-language group tours are offered.) You can sample the wines at the hospital's wine bar, too. If you prefer an outdoor experience, consider renting a bicycle and exploring the countryside. In Würzburg, you can rent bikes from Bikes and More Ludwig Körner. The Rheingau is riesling country. The Rhine River winds through this wine region, making exploration extremely easy. You can hike, bike or drive your way through the Rheingau, or hop on and off trains or boats at towns along the river. You'll find plenty of places to explore, including Bingen, where the famed abbess Hildegard wrote and composed, as well as wine-themed hiking trails and biking paths. You can also visit castles and monasteries in this picturesque wine region. Kloster Eberbach in Eltville am Rhein offers rooms with breakfast, wine tours and sales and seasonal restaurant meals. The historic city of Wiesbaden, famous for its spas, which date back to ancient Roman times, is packed with wine bars and restaurants. If you plan to visit during the month of August, try to be in Wiesbaden during the nine-day Wiesbaden Wine Festival, where over 100 wine producers offer you the chance to sample their products. The Pfalz, or Palatinate, is best known for the Deutsche Weinstraße, a driving route that takes you through tiny towns, sweeping vineyards and a large city or two. The Deutsche Weinstraße begins at the Deutsches Weintor (German Wine Gate), an imposing structure at the French border, in the town of Schweigen-Rechtenbach. From there, you'll drive north, following the yellow and black Deutsche Weinstraße signs. Rüdesheim is another great place to begin your journey, even if you can't make it to the annual wine festival, held during the third weekend of August each year. If you're there during the summer months, head to the market square (Marktplatz) and try a local wine or two. Stop and explore a few of the towns along the Deutsche Weinstraße. They're fairly compact, and most of them have historic downtown areas with fountains or gardens that seem to invite you to enjoy the outdoors. Signs marked "Weinprobe" (wine tasting) are everywhere; stop in and try a local wine or two. (You may be asked to pay a few Euros for the privilege.) In the fall, stop at a roadside stand and sample the new wine; it tastes like grape juice with a bit of fizz.